Preston Lodge High School Pipe BandPLHS Pipe Band in China! PLHS Pipe Band in China! 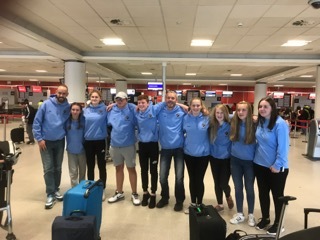 Preston Lodge High School Pipe Band has just returned home after a successful trip to China where they represented Scotland at a festival attended and watched by thousands. The pipe band, which is led by Pipe Major Lee Moore, was invited to perform at the Nanning International Folk Song Festival; a rare privilege as they are the only school group from outside Asia to ever be asked to perform. They performed with other musicians from across Asia to a stadium audience of 50,000 and the opening ceremony of the festival was televised. The pipe band, which is funded by music charity, Scottish Schools Pipes and Drums Trust, also visited schools in the Guangxi region of southern China, accompanied by a member of the Scottish China Education Network. The Preston Lodge High School youngsters shared experiences with other young musicians whilst experiencing Chinese culture and hospitality at its finest. After a visit to Nanning Out of School Educational Activity Centre, the SCEN and Director of the centre signed a Memoranda of Understanding to establish long-term links and exchanges. Watch some of the band take to the stage to give the crowd a drumming lesson! Previous Previous post: Time to get composing!